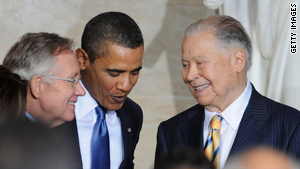 Sen. Harry Reid, left, and President Obama present the medal to former Sen. Edward Brooke on Wednesday. Washington (CNN) -- Edward Brooke, the first African-American elected to the U.S. Senate by popular vote, was honored Wednesday with a Congressional Gold Medal. "At a time when so many doors were closed to African-Americans, others might have become angry or disillusioned," President Obama told an audience in the Capitol Rotunda, where the ceremony honoring Brooke for Congress' greatest honor was held. "They might have concluded that no matter how hard they worked, their horizons would always be limited. So why bother? Not Ed Brooke," he said. Brooke, 90, was a Republican senator from Massachusetts for two full terms, from 1967 to 1979. "He ran for office, as he put it, to bring people together who had never been together before, and that he did," the president said. "I don't know anyone else whose fan base includes Gloria Steinem, Barney Frank and Ted Kennedy as well as Mitch McConnell, Mitt Romney and George W. Bush. That's a coalition builder," he said. He ran for office, as he put it, to bring people together who had never been together before, and that he did. Brooke grew up in segregated Washington and served in the Army during World War II. Afterward, he received a law degree from Boston University and eventually ran for attorney general of Massachusetts. "November 6, 1962, was a special day for President John Kennedy," Sen. Harry Reid said at the ceremony. "It was the day his brother Ted won his old seat in the United States Senate ... but ... President Kennedy took particular notice of another result from that same ballot in Massachusetts: The people of the president's home state had elected Edward Brooke to be its attorney general, making him the first African-American to hold statewide office in Massachusetts and the first African-American to serve as any state's attorney general," Reid said. "President John Kennedy exclaimed ... 'That's the biggest news in the country.' "
Brooke thanked the president and the congressional leaders for the honor. "I love this country, since the day I was born, and I was born in the nation's capital on October 26, 1919," he said. "Most of you weren't there at that time." He said it would have been a perfect day "if it weren't for the fact that my friend, my senior senator," Ted Kennedy, wasn't there. "We don't control life and death, and we couldn't control Ted, or he would still be with us," Brooke said. Ted Kennedy died in August. Brooke also implored political leaders to cooperate. "We can't worry that you all can't get together," he said. "You've got to get together. We have no alternative. There's nothing left. It's time for politics to be put aside on the back burner."